A report from the Rehabilitation Shareholders Conference. 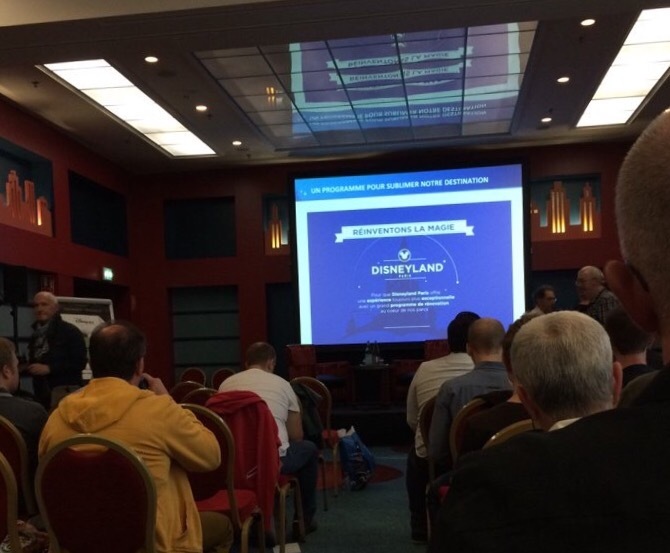 Shareholders of Disneyland Paris were invited to a conference held at Disney’s Hotel New York Convention Centre on Wednesday 28th September 2016 for a presentation on the on-going Experience Enhancement Programme currently underway at the resort. Here is a short summary of the presentation given by Daniel Delcourt, Senior Vice President and Chief Operating Officer of Disneyland Paris. A new automatic train recovery system is being installed that will reduce the time it takes for the ride to become re-operational after an emergency stop. Under the old system the ride trains had to be towed to the loading area and the recovery used to take at least an hour. With the new system being installed the recovery time will be reduced to around 20 minutes. Enabling the ride to become operational much sooner after a 101. The ride will also see the installation of new special effects and the famous geysers on the banks of The Rivers of the Far West are set to become operational again for the first time in 20 years. The rides post show area will become the largest Star Wars boutique in Europe, and the existing Star Traders boutique is being transformed become an indoor Meet ‘n’ Greet character location. A Star Wars version of the popular Princess Pavilion. A new X-Wing fighter will be installed on the roof of the Star Traders building replacing the communications antennae that was blown up during the finale of the Last Flight to Endor event. A complete rehabilitation of the Pirates of the Caribbean ride is planned which will see new effects added to the attraction. The ride is scheduled to be closed between early January 2017 until summer 2017. The Studio Tram Tour: Behind the Magic attraction at Walt Disney Studios Park has been removed from the Experience Enhancement Programme for the time being and a refurbishment programme of the attraction is under study. The is the possibility that the show will change with the integration of elements from the forthcoming Cars 3 movie which is scheduled for release in summer 2017. A complete rehabilitation of the Phantom Manor attraction in Frorntierland is planned after the 25th Anniversary. The refurbishment will also see new scenes added to the attraction. This will be the rides first full refurbishment in it’s 25 year history and will last for six months. The Discoveryland attraction Space Mountain will receive a make-over inside the ride. No further information about this was given but speculation is that the ride will receive the Hyperspace Mountain make-over that other Disney Theme parks have received. A quality improvement programme of the products and services offered at the resorts restaurants is underway. All beef burgers served in Disneyland Paris are now from Angus cows. In Casey’s Corner hot dogs can be ordered with a either beef of pork sausage and there will be a hot dog of the month launched. There is no indication of a vegetarian sausage will be made available yet. There are plans for a dish based on the theme of each of the restaurants to feature on its menu. In the buffet restaurants interaction between Guests and Casts Members is being encouraged during the cutting and serving of dishes. It was also confirmed that Buzz Lightyear’s Pizza Planet restaurant in Discoveryland will remain closed and will not open again in it’s present format and theme. The return of a parade in the Walt Disney Studios park is under consideration, we do not know what this will be, but some type of daily parade is being considered. There will be an increase in the number of characters Meet ‘n’ Greet locations in the resort which will increase the opportunity for Guests to meet with the characters. This may include an additional Marvel Meet ‘n’ Greet location added to the Walt Disney Studios park. There at no plans for adding any new attractions to the resort at the moment. There will be some changes made to the Disney Dreams! night time spectacular in the Disneyland Park for the 25th Anniversary and permanent shows will return to the Castle Stage in Fantasyland. Free Wi-Fi is now available in all the resorts hotel rooms, the service is currently being installed in the newly refurbished Texas rooms in Disney’s Hotel Cheyenne. It was admitted to Shareholders that the refurbishment of Disney’s Newport Bay Club Hotel which was performed in two parts was a mistake. Many complaints were made by guests because of the noise pollution generated and the disturbance caused to residents who were staying in the hotel during the time of the refurbishment works. In future hotels will now be completely closed during their rehabilitation. The next hotel to be renovated will be Disney’s Hotel New York, which will commence soon and will last for 18 months. Then it will be the turn of the Disneyland Hotel. The Casts Members recently elected their “Ambassadors” and just over 6,000 Cast Members participated in the “Join the Disney attitude” training programme. Complimentary wireless high-speed Internet access is being installed in the theme parks. The Wi-Fi service will become operational in 2017, first in the Walt Disney Studios Park and then in the Disneyland Park. Delegates were told that the problem of guests smoking in the theme parks is being taken very seriously by the resorts management. The litter bins in the resort are being updated to feature No Smoking signs. This signage has been applied to enable Casts Members to make it clear to visitors that the parks are Non Smoking. Cast Members will then guide Guests to the dedicated smoking areas. The existing No Smoking signage in the resort has been enlarged and 300 litter bins are due to have the new No Smoking signage added to them. A test will be performed from October in some of the toilet blocks in the resort where a push-button will be installed to enable Guests to report on the quality and cleanliness of the toilets. The system will be connected directly to Park Operations which will enable them to send a cleaning crew when required. There will be changes made to the ticket turnstiles to enable the use of the new style park ticket. The newly introduced RFID Magic Cards which are issued to hotel residents will soon be fully integrated into the parks systems and will include park tickets, PhotoPass, Meal Vouchers and their hotel room key. At present the card can only be used a hotel charge card. A new water filtering system has been installed to prevent the water pools in the park from turning green with algae. 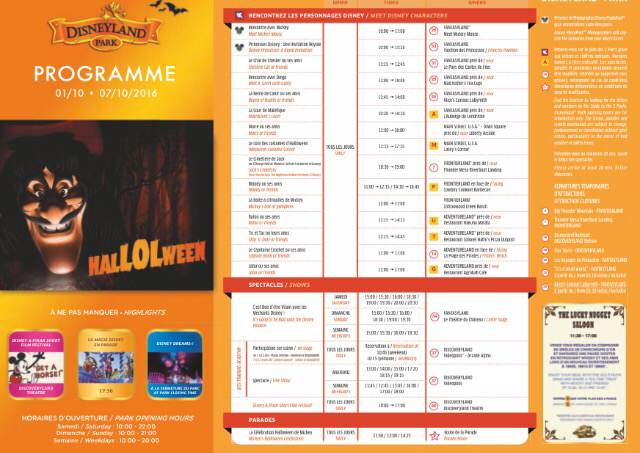 The first programme for the 2016 Halloween season (1 – 7 October 2016) has been released by Disneyland Paris and it has been added to our Show an Parades Programme Archive page. 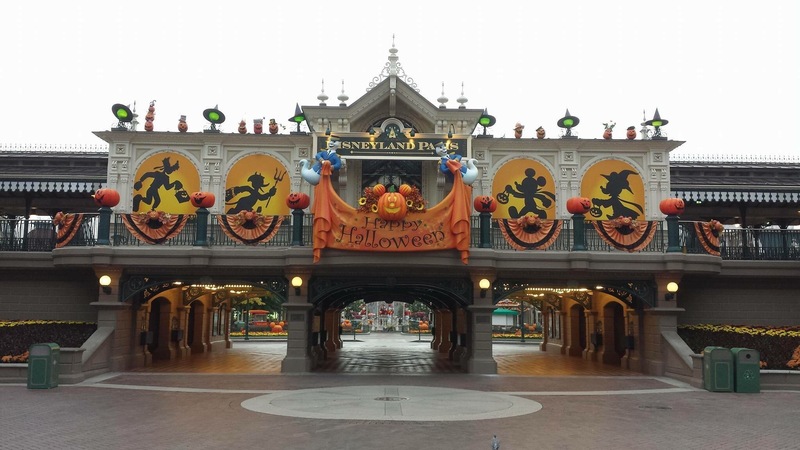 Disneyland Paris has a treat installed for character fans this Halloween season with a whole range of characters to meet at the resorts Meet ‘n’ Greet locations. 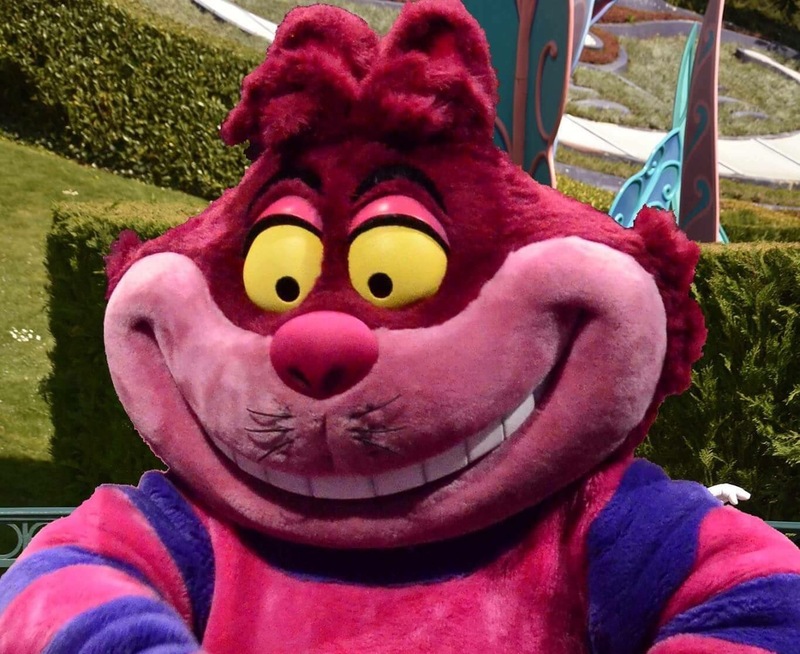 This Halloween season sees the premiere of Cheshire Cat meeting fans and he is joined by Captain Hook, Maleficent, Jack, the Queen of Hearts and many more. There is also the It’s Good to be Bad with the Disney Villains! show being held four times a day on the Castle Stage and Mickey’s Halloween Celebration parade will be travelling along the parade route three times day at 11:50 / 13:00 / 14:25. Disney’s Newport Bay Club Convention Centre has reopened following an eight-month refurbishment. Operated by Disney Business Solutions the convention centre offers 5,500sqm of modular meeting space, spanning 23 rooms and catering for up to 2,088 delegates theatre-style. Areas include the 1,800sqm Ballroom and the 2,400sqm Portland space. Upgrades to the venue include the installation of the latest meetings technology. The four-star Newport Bay Club hotel underwent a renovation that was completed in spring this year. It is being reported by meltySTYLE that a branch of the American restaurant chain Five Guys will open in the Disney Village in Disneyland Paris in early 2017. The first Five Guys restaurant opened in 1986 in Arlington County, Virginia, and the chain serves hamburgers, hot dogs, French fries and milkshakes. 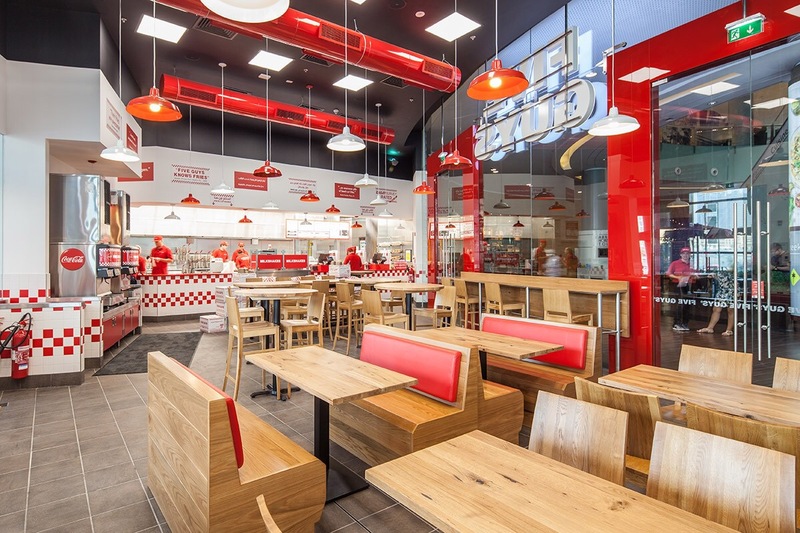 Five Guys restaurants are decorated in red-and-white checks and have open kitchens, and a single counter for purchasing and the picking up of food. Bags of potatoes are sometimes stacked in the restaurant for aesthetic reasons. Guests will be able to choose from a multitude of toppings for their burgers and hotdogs. A typical Five Guys have more than 250,000 possible topping combinations to choose from and 1,000 mix-in milkshake combinations. Five Guys are also know for their Coca-Cola freestyle machines giving customers the chose of 125+ drinks choices! From Orange Coke to Raspberry Sprite. The restaurant is rumoured to be opening next to Vapiano which is presently under construction in the Disney Village in the former NEX Arcade alongside the Gaumont IMAX building. 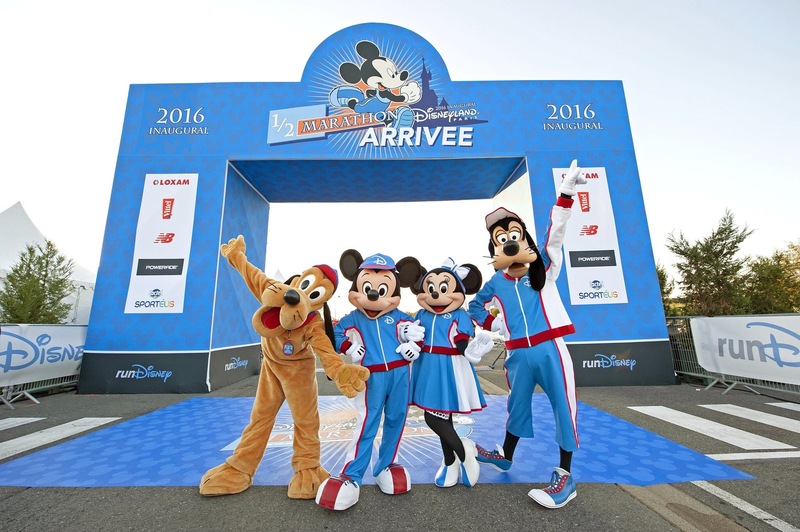 This weekend Disneyland Paris hosted their inaugural runDisney Half Marathon and we wish to congratulate all the competitors who took part. 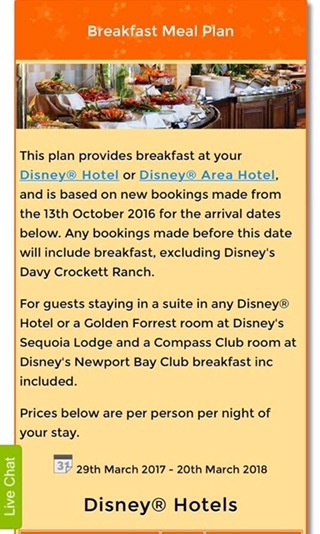 According to UK travel agents ‘Magic Breaks’ it appears that Disneyland Paris will commence charging Guests for breakfasts at their resort hotels for bookings made after 13 October 2016 for stays from 29 March 2017 onwards. Guests staying in suites and club rooms are not effected by this move. So breakfast is still included in the room rates for Guests staying in the Golden Forest Club, Compass Club, Empire State Club and Castle Club. Magic Breaks broke the news last month of the new Season of the Force events to be held in The Walt Disney Studios Park several weeks before the official release by Disneyland Paris. The move will bring Disneyland Paris into line with other Disney Resorts in the Walt Disney Parks and Resorts Worldwide Inc. group where hotel rooms are sold on a room only basis and breakfast is a chargeable extra. Disney’s Partner hotels will also be effected by the move apart from the Explorers Hotel where breakfast will remain free. 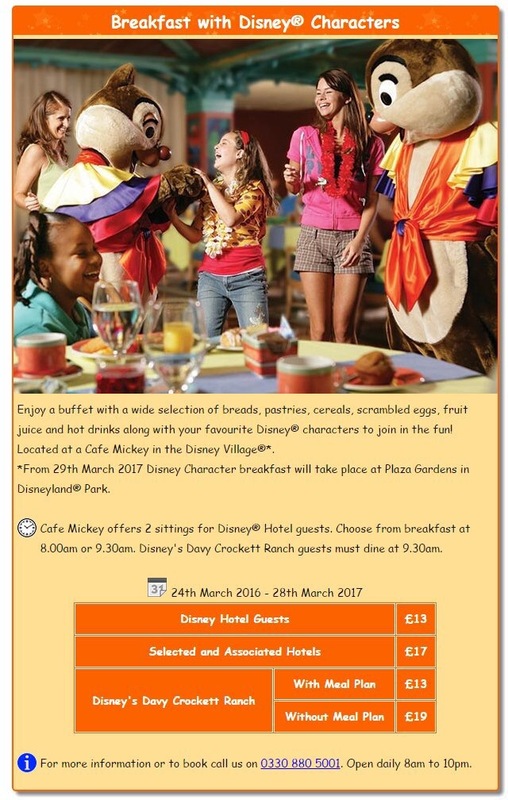 Magic Breaks also mention that Character Breakfasts are to be relocated from Cafe Mickey in the Disney Village to Plaza Gardens in the Disneyland Park from 29 March 2017. How the implementation of this new Breakfast Meal Plan will go down with regular visitors to the resort is yet to be seen, but it will certainly cause come controversy with the resorts frequent visitors and fan base. The new Disneyland Paris holiday brochure is expect to be released next month. Members of the Euro Disney S.C.A. Shareholders Club are being invited to attend a conference being held on Wednesday 28th September 2016 at Disney’s Hotel New York, Convention Center at Disneyland Paris that will cover the Experience Enhancement Programme currently underway at the resort. The event will be held from 6:00 pm to 7:45 pm and will be presented by Daniel Delcourt, Senior Vice President and Chief Operating Officer. The conference which will be held in French will be followed by a Question & Answer session. To attend this meeting shareholders must register online via the Your Personal Space section of the Disneyland Paris corporate website. Shareholders will receive a confirmation registration e-mail that you will need to present to gain access to the conference. 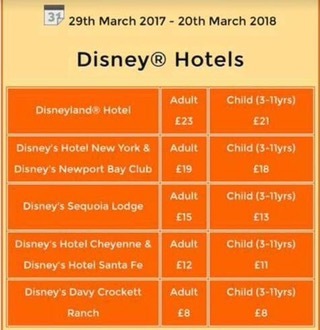 Free access to the Disney’s Hotel New York car park will be given to the registered participants, showing their valid Shareholders Club card and/or their registration confirmation. Please note that availability is on a “first come, first served basis” and is limited to Shareholders Club Members only for one place and they will not accept any walk-in participants. Registration for this event does not include free access to the Disneyland Park or the Walt Disney Studios Park during opening hours.